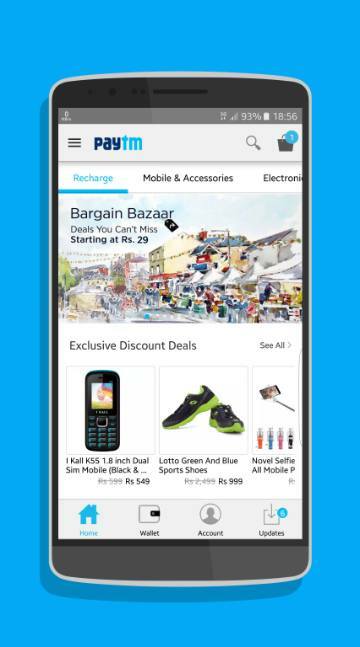 PayTM is an abbreviation from `pay through mobile`. It is a very popular online place in India which offers DTH and mobile recharges, as well as shopping. You can also book your busses through their application. Not just that, but all PayTM users have the opportunity to pay for their gas at petrol pumps by using their wallet. Their platform has almost thirty million downloads, so it is pretty safe and secure to use it. 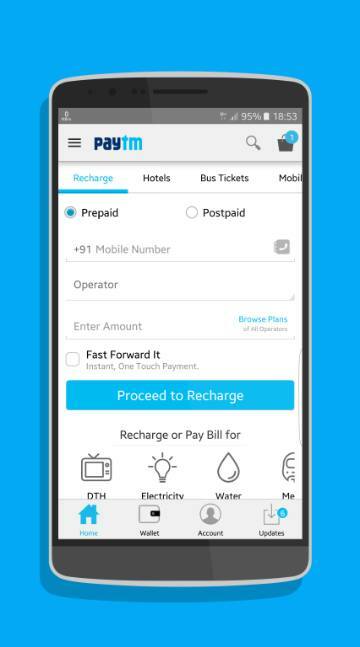 Positive about PayTM is that it works on all cell operators in India and in each state. The mobile application is ranked among the most popular ones and can be downloaded in just a matter of seconds. The number of users is constantly rising, because here you can find a one stop place for everything, ranging from purchasing bust tickets, to recharging of mobile phones and paying for different kinds of bills. There are several interesting details and good features on the application. It does not matter which mobile operator you use, you can visit the site or download the application and make your secure online payment. Besides recharging, you can pay all bills for utilities without any problems. The platform also supports paying for electricity, gas, even landline bills regardless of your location in India or the time. Buying bus tickets proves to be very easy, as you can avoid standing in long lines just to get a bus ticket. Another good feature is the PayTM shopping. By using PayTM cash you can shop for thousands of different articles, without any hassle. Recharging data cards is also an option that is being offered, so instead going to banks you can finish all that in a just a few minutes on your mobile phone. So how exactly does recharging work? It is pretty simple, really. All you have to do is follow three simple steps and you are done. First you enter the details about the recharge, and then you are directed to another page where you select your payment option. Payment options covered are credit and debit cards, net banking and American Express cards. As soon as you select your preferred payment option, you fill in a few important details and that is it! You will have no problems moving through their website or their application, as the layout of the site is very easy and simple to navigate on. Other great thing about PayTM is their often discounts and coupons that you get on every recharge. In order to get a discount coupon you do not have to pay or buy anything special, because they are sending you different codes for discounts on your e-mail address, as soon as you make any kind of recharge. This is a great option for saving money while recharging your mobile phone. By using the promotional codes you can buy lots of great stuff on the site. In conclusion, PayTM is a really great option if you want to recharge or pay bills without any stress and to do it quickly. Discount deals could be a little better, but in general it is very good platform worth trying.